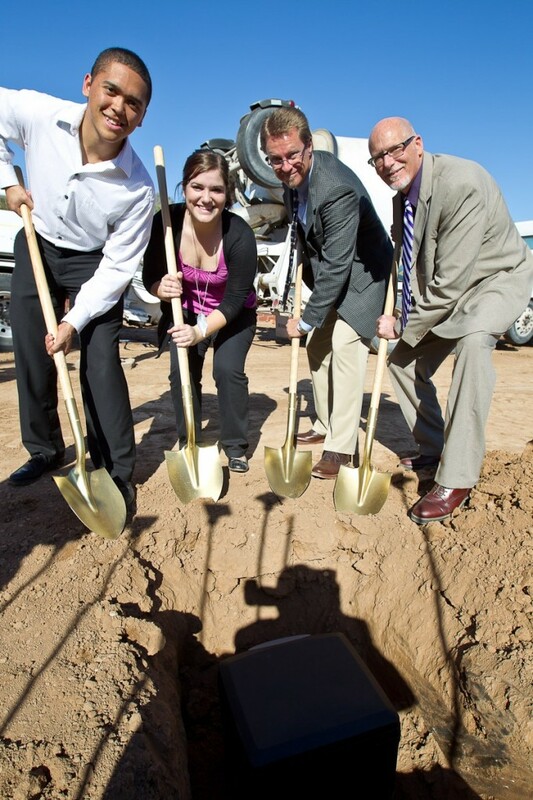 Grand Canyon University broke ground on another new dorm Wednesday, January 26 in a ceremony on campus. ASGCU President Anthony Mann and Vice-President Elise Hull presented a time capsule with items for the ‘Lopes of the future. The following is a list of times contained within this time capsule. The FYP magazine was placed in the capsule as a means to demonstrate the exciting things happening on campus as well as to highlight several construction projects and things relevant to students. The articles from the Herd online newspaper were placed in the capsule to document 5 major happenings at Grand Canyon University during the 2010-2011 school year. A cell phone was placed in the time capsule simply to demonstrate the relevance of technology to today’s culture. It is nearly impossible to find someone on campus today that does not have a cell phone. A 2010-2011 Welcome Week t-shirt was placed in the capsule to demonstrate two things. The first serving as remembrance of the record enrollment of ground students to the University. The second reason is simply to demonstrate the shirt’s popularity amongst the student body. Posters of the athletic team schedules were placed in the capsule to represent the large athletic community on campus, a major force within the student body. As well, they may serve as a reminder of the growth and tradition experienced over the years. Pictures of the 2010-2011 Student Leadership team and student events were placed in the capsule to visually document the students who invest so much into making Grand Canyon University a place we all call home. May these pictures serve as a reminder of the reason we all work so diligently in our commitment to our University. Finally, a Bible was placed in the time capsule to remind everyone of why we are all united together in this one place. God has worked in amazing ways at Grand Canyon University and will continue to do so. May this Bible serve as a reminder that we all must always remained focused on Him, as we look upon the past and continue into the future. May these items bring you joy in remembering our past and serve as a reminder as to why we continue to progress into the future.